If you are just starting out and looking to gain a general understanding of the exam, this book may suit you. 80% of the book is devoted to Section 3: Reasoning in Biological & Physical Sciences. It’s quite handy as a revision guide since it outlines a specific syllabus of science topics to cover. The biology section is, in my opinion, the best. It’s very clear and has some great diagrams. The physics section is a bit underwhelming by comparison. Chemistry and Organic Chemistry are the most detailed of the science sections. In fact, if you come from a non-science background, these chapters may go over your head somewhat. The Gold Standard tutorials on Youtube exist for exactly this reason. They’re free and probably worth checking out. Be keen to exercise scepticism when taking spelling and grammar advice from an American book which, at the best of times, doesn’t spell words the same way your Irish, English and Australian examiners will like to see them written. Essay writing aside, the Section 1 material is fairly passable. There’s not a lot of it, but what’s there isn’t bad. The practice paper at the back of the book is the most useful part and is very realistic in its representation of the actual GAMSAT. My favourite part of the book would have to be Appendix A: GAMSAT Math Review. Don’t be offended by the lack of an ‘s’ at the end of Math, these 5 pages contain some really clever stuff: all the equations you need for solving Section 3 problems. 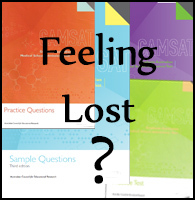 A huge amount of marks are lost on the GAMSAT because students aren’t sure where to put the decimal place or how logarithms work. Appendix A explains all that stuff so you need not lose marks unnecessarily. 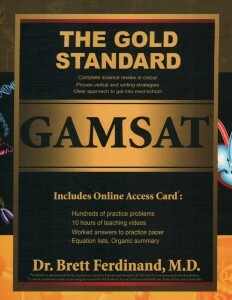 In summary, Gold Standard can’t be relied on to get you all the marks, but it will get you off to a good start. Side note: Many of the chemistry concepts in Gold Standard are difficult to understand without some prior knowledge. if you are coming at the GAMSAT from a non-science background you might consider grabbing a copy of Chemistry for Dummies and Organic Chemistry for Dummies from Amazon. They’re brilliant.